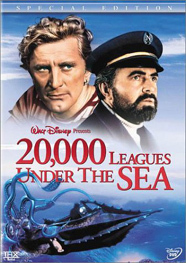 One the best projects Walt Disney ever undertook, 20,000 Leagues Under the Sea is an exciting and essentially faithful adaptation of Jules Verne's most popular 'Voyage Extraordinaire'. It was received as a breathtaking wonder upon its Christmas release in 1954, and kept its glow in many reissues thereafter - I don't remember ever hearing a kid say anything bad about it. Disney's vision was matched, luckily, by the solid practical help of his businessman brother. For his first bigscreen live-action superproduction, he picked a property with countless unknown production hazards. It needed to have special effects the likes of which nobody had seen before. It would be filmed in a brand new process for which there was only one lens available. And he had to assemble the best technical resources in Hollywood, when he was known primarily as an animation producer. About ten years ago, Disney released an impressive laser disc with many extras, but this special edition DVD easily beats it in both the transfer and goodie departments. 1870. 'Alarming rumors' of a monster have emptied the sea lanes, and the United States sends a warship to track it down. Along for the ride are two French scientists, Professor Arronax (Paul Lukas) and his faithful aide Conseil (Peter Lorre). When their ship is destroyed by the monster, they and harpoonist Ned Land (Kirk Douglas) find their way to its floating hulk, which turns out to be a submersible water craft. It's actually the Nautilus, the invention of mad revenger Captain Nemo (James Mason), who exercises his grudge against war-making nations by sinking their warships and munitions shipments. At first charmed by Nemo's personal undersea empire, the three captives soon conspire to escape, and to find a way to put an end to Nemo's engine of destruction. 20,000 Leagues Under the Sea opens with a screen bathed in light from a rippling underwater source. As the show was one of the first filmed in the new anamorphic CinemaScope process, the wide image was originally wider, spread out to a ribbon-like 1 to 2.55 aspect ratio. Disney shrewdly composed his titles in the center of that spread, as his previous live-action efforts had basically been for television, and he anticipated the film's eventual arrival on the smaller format. 1 The film has some amusing scenes in San Francisco and aboard Ted De Corsia's warship, but it is not long before we're completely immersed in Captain Nemo's fantastic underwater world, cruising in a submarine designed so well that we accept its reality without question. There are undersea diving suits and a round iris window to view the magic of the deep, and the craft's comfortable but cramped interiors are invitingly believable. Today, the most startling aspect of Leagues is its tone. There's some singing and a cute trained seal, and running gags between Kirk Douglas' blustery seaman and Peter Lorre's dour valet, but the overall impression is dark and deadly serious. At a time when real submarines were risky craft likely as not to kill their crews, Jules Verne proposed this fully realized super-sub almost as a fanciful visitation from the future, with its propulsive secret only superficially explained. His Captain Nemo was an escaped slave, once an Eastern prince - not a white man - who somehow became a scientific genius, creating miraculous futuristic technologies solely for revenge. Verne's unlikely hero is easily recognized as what we call a Terrorist. He's a political zealot who uses violence to strike back at the colonial powers that have oppressed him, and tortured and murdered his family. In the original book, he's a Third-World slave put to work mining the ingredients for high explosives. Everything he does is motivated by hatred for what he refers to as "that hated nation". If Verne had added a religious motive, Nemo would be a clear cipher for Osama Bin Laden, packing a weapon of mass destruction in the form of his futuristic submarine. James Mason's filmic Captain Nemo glowers and fumes with an intensity that overshadows the whole enterprise, and his singular vendetta is echoed in grand shots of the Nautilus prowling slowly in the blue depths to the grim chords of Paul Smith's musical score. He's the original unconscious manifestation of (literal) sub-versive hatred, a pacifist who hates the hypocrites of society, and sees all politics and nations as an Enemy to be opposed at every opportunity. For an irrationally conceived character - it's assumed he's a misguided madman, as the movie endorses the humanistic reason of the dull Professor Arronax - Nemo is a magnificent antihero. Placed in a scene with the jocular Kirk Douglas, who pulls faces and acts all hale and hearty, James Mason's gloom wins every time. Just about the only actor who could pull off the same role would be Vincent Price ... but in our hearts we know Price is really a rather jolly fellow: Mason is obsession personified. The end of the Nautilus, in Disney's version, is a bleak götterdammerüng. (spoiler) The book had the damaged sub going down in a Norwegian maelstrom, if I recall correctly, but here writer Earl Fenton pulls in ideas from Mysterious Island and other Verne stories. Nemo returns briefly to his secret island base, only to discover it overrun by colonial troops. We get a quick impression of his super lab (complete with radar dish - ??) before he pulls a patented Bride of Frankenstein lever to blow it all to kingdom come. Not only does Nemo keep 'that hated nation' from stealing his scientific secrets, he gets a revenge of sorts by nuking a small army and navy of assorted national interests. Nobody ever seems to point out that this mainstream fantasy film ends with the murder of hundreds, perhaps thousands of First World colonials. There isn't a similar scene in films until the overtly radical Giù la testa (Duck, You Sucker!) in which James Coburn gleefully dynamites an entire armed division, happy to 'rid the world of a few uniforms.' We're given Professor Arronax's verbal judgment on Nemo as a warped madman, but everyone I ever saw the picture with wanted Nemo to win and sink every warship afloat. Disney's DVD of 20,000 Leagues Under the Sea 5 looks fine in enhanced widescreen, with a lot of delineation in the various blues and greens of the ocean depths. There is some grain - this is a 50 year-old picture shot on some of the earliest Eastman stock. The box lists the aspect ratio as 2:55 to one, but it doesn't look any more wide than the usual 2:35 transfer. In compositions where characters fill the frame, those at the extremes tend to be a bit crowded. Chances are the marketing writer read the ratio off an old stat sheet. At least the image is centered on the screen - a 35mm showing I saw at the El Capitan in Hollywood in the early 90s used a lopsided print that favored the right extreme of the 2:55 frame. The second disc has a nicely balanced set of extras. The new docu is marvelous, a much better piece than the laser disc's 1954 television show that served as a primetime ad for the movie. Walt had some cute tricks up his sleeve - he got paid big $$ by the networks to advertise his own product! Along with director Richard Fleischer, critic Rudy Behlmer (was Leonard Maltin sick that day? ), and an enthusiastic Kirk Douglas are several reels' worth of fascinating behind-the-scenes footage, in 16mm color. Everything of interest is covered - we get to see stage waits when the actors break character, and the technical apparatus behind many setups. Fleischer is seen a lot as well. The footage illustrates the docu narrative perfectly: Douglas accidentally whacks Lukas with an oar in one shot, and so much water flows out of Disney's sound stage during the Squid scene, casual visitors need to wear galoshes. It's an absorbing show. For the less keen, there's an okay doc on the combined genius of Verne and Disney, which focuses mostly on Disney. A 'Disney Studio Album' for 1954 is a montage of the studio's insane number of fiscally risky activities in that pivotal year. Another short subject on The Humboldt Squid raises our awareness of the power and danger of real squids, that actually do swim both ways, forwards and backwards, as pictured in the film. A special piece of rediscovered film is a set of takes of the first abortive attempt at the Squid scene, where the rubber monster is seen in flat lighting before a sunset backdrop. This is a cut version of unedited 16mm behind the scenes shots, not dailies, which accounts for the less-than optimal angles. The filming probably reached a stage where all realized nothing was working, and this flat footage was helpful to analyze the problem. The greatest testament to Disney was his ability to Bet the Farm on his instincts, and when Squid One turned out to be an expensive fake flop (like something from Hammer's The Lost Continent), he had no problem going back to the drawing boards. The final scene is a remarkable improvement; interesting that it took 50 years for this footage to come to light. The rest of the extras are listed below. I've been through enough Disney discs now that accessing their gauntlet of animated menus to get to the goodies isn't as annoying as it used to be. 1. The only other time I can remember that particular trick was for Roman Polanski's Chinatown. It begins by composing its main titles as if they were from a 1940s Academy-ratio film noir. Early CinemaScope's crude optics (straight from French inventor Chretien) frustrated cinematographers. Its warped field of vision gave many shots in 20,000 Leagues Under the Sea the 'CinemaScope Mumps' - in many shots, actors' heads seem to squash out horizontally. Franz Planer avoids unnecessary horizontal pans that would reveal all kinds of distortion in the lenses. They had only one lens for the whole film (! ), which inspired Harper Goff to have 'squeezed' Nautilus models made, so that the sub could be shot flat underwater, and when spread out, look correct! If you look closely, there are a number of underwater shots that are done this way. 2. I remember cheering like mad with a theater full of other ten-year olds, as the trailer for the nautilus opened up with just the high-pitched Tasmanian Devil whine of the Nautilus zooming toward us, its wake splashing over its yellow view port eyes. Movies in the big theaters were magic then, and the sight of the sub's screaming attack projected on the theater's shimmering curtains as they opened was a wonderment. 3. The Disney I love is the one before Disneyland, before he became the beacon of sweetness and light and the status quo. He was not only creatively daring, but he had no problem expressing all of his personal fears and bugaboos in films - there are scenes in Snow White, Bambi and Pinocchio that are terrifying to little kids. Fantasia and Dumbo had sections that seemed like the experience of a drug addict or an alcoholic. If Dumbo has a message beyond mother love, it's that You Have to Get Drunk if You Want to Fly, Kid. Even smaller projects like The Adventures of Ichabod and Mr. Toad show an absolute delight in the joys of total irresponsibility. 20,000 Leagues Under the Sea seems to recognize Verne's Terrorist hero as yet another of the author's 'futuristic visions'. Along with the atomic submarine, he foretold the day when colonialism would give birth to implacable Terrorist avengers. 4. (Side Note) In the 1970s, Tom Scherman, a prop maker and designer in the 'Cascade' generation of special effects men, built many beautiful replicas of Goff's Nautilus, some so elaborate that they were bought by Disney for display purposes. He was even selling them for hundreds of dollars, I believe. Scherman was known to me as a 12 year-old, when we read in Famous Monsters that 'little Tommy Scherman' had seen 20,000 Leagues Under the Sea in theaters 40 times. I met him several times through the miniature crews I worked for, and he was a charming fellow. 5. The on-screen title has no comma in the numeral, but the '20' is in a larger font, perhaps making one unnecessary. When '20000' looks so wrong in print, you can't go by the actual title card all the time. The movie was such a success that many other Verne visualizations followed in its wake. Other pictures mimicked its title to perhaps catch some of its magic: The Phantom from 10,000 Leagues, 20 Million Miles to Earth, Around the World Under the Sea. By the way, a 'League', according to the dictionary, is 4.8 kilometers, or about 3 miles. 6. Goff's work becomes especially noteworthy when one notes the patchy work on submarine designs seen elsewhere. The super-sub Seaview of Voyage to the Bottom of the Sea (which 'borrowed' Peter Lorre for a similar role) looks rather cool, like a finned Cadillac ready to tour the ocean bottom, but the Fox effects people could do little more than just shove it through the water and hope it would go straight. In many takes it leans to one side, and its poorly animated diving planes move like a bad toy. Going even further down, the vessels of The Atomic Submarine look as if they came out of a cereal box. Only Toho's Atragon has some measure of majesty to match Harper Goff's work, and it is more of a 'transformer' toy, flying through the air and drilling through the Earth. I like those wooden decks though, they're a nice touch.